After a two-week break from LF2 basketball nothing has really changed. Cavigal Nice keep on winning while the rest of the teams beat each other. Although it is too early to crown Niss'Angels as LF2 regular season champions they are way ahead of the rest with just two defeats. This weekend Cavigal Nice hosted the CFBB in a potentially tricky game. The CFBB have a reputation of playing their best basketball against the leaders. However this weekend they managed to hold Cavigal Nice for just six minutes (7-7) before being relegated to spectators. Cavigal Nice hit 34 baskets during the game of which 30 were scored via an assist. If not for some wayward shooting from beyond the arc Cavigal Nice would have had a shooting percentage closer to 70%. 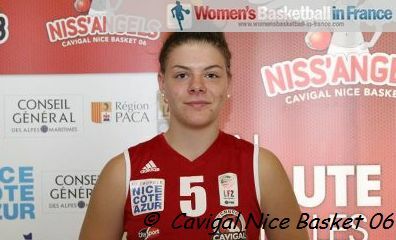 Cavigal Nice won (82-47) with all nine players getting on the score sheet. Five players finished in double digits and five players were credited with at least 5 assists. This match gave Marie-Eve Paget (in picture) a chance to show some of her skills with 7 points, 6 assists and 5 steals in 24 minutes. The Niss'Angels are three wins away from confirming their place in the post-season Final 4. In the remaining four games from the LF2 weekend only Léon Trégor came away with a road victory. They beat a weakened US Laveyron (81-57) with a big second-half push. Léon Trégor had an impressive shooting day, hitting 64% of their shots. Cécile Baudy and Marie Butard were the leading scorers with 16 points each while Marie-Julie Levant added 15. For US Laveyron Leslie Fournier had a game high 17 points. Roche Vendée's luck changed in the positive sense this weekend as they recovered from a (23-29) first-half deficit to beat COB Calais (59-48). Calais made just 7 shots during the second half of the game as they fell to only their third defeat of the season. 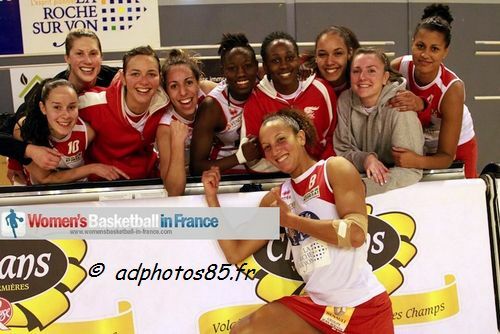 Reims BF beat Dunkerque (79-65) in the most interesting match of the weekend. Too many shoots were attempted from beyond the three-point line (46). Reims hit 5 more than Dunkerque and won the match by 14 points. Maud Lesourdard is having her best season ever with the senior team in Reims. She led the way with 23 points from 8-of-11 shooting. Pau Lacq Orthez held off Illkirch-Graffenstaden (66-61). Leading by 14 points going into the final quarter, Pau almost threw the game away as the SIG fought back in a highly emotional game. Philippe Breitenbucher picked up a technical foul late in the third quarter for arguing with the officials. He also had two of his players foul out. Mariame Dia and Ingrid Bunel with 14 points each were the key players in the victory for Pau while Céline Schmitt had 24 for the SIG. Pau Lacq Orthez and Reims BF are in fifth and sixth place and for the moment can still dream of sneaking into the top 4.